The little sister of Koh Bida Nok has a different underwater terrain. More boulders and fallen rocks here make some interesting swimthoughs that are often hidden by large shoals of glassfish. Good bouyancy control here is essential as bearded lionfish are lurking on the bottom. 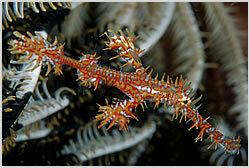 Upon closer inspection of the walls and caves you may be lucky enough to spot a ghost pipefish or boxer shrimp. There is a coral outcrop called Fantasy Reef where you can spend some time and a staghorn garden where you may come across leopard or black tip sharks.